(Nanowerk Spotlight) A little trivia you might not know about: The Beatles are responsible for computer tomography (CT). No, John, George, Ringo, and Paul weren't moonlighting scientists, but you could argue that their musical success was directly responsible for the invention of CT. The technology, which produces cross-sectional images, or slices, of internal body structures has become an extremely important diagnostic tool in the field of medicine. British engineer Godfrey Hounsfield conceived and developed the idea at Thorn EMI Central Research Laboratories in England in 1967. He was able to spend four years developing the scanner into a practical clinical tool with funding made possible by the huge profits EMI earned from the sale of the Beatles' records. The first clinical CT scanners, which were installed in the mid 1970s, were dedicated to head imaging only, but whole body systems became available in 1976. By 1980, CT became widely available. There are now about 30,000 CT scanners installed worldwide. The first CT scanner developed by Hounsfield took several hours to acquire the raw data for a single scan and took days to reconstruct a single image from this raw data. The latest multi-slice CT systems can collect up to four slices of data in about 350 ms and reconstruct a 512 x 512-matrix image from millions of data points in less than a second. 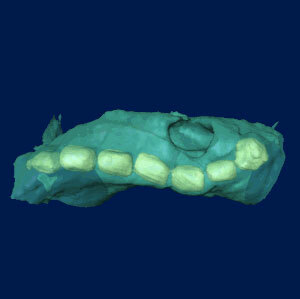 An entire chest (forty 8 mm slices) can be scanned in five to ten seconds using the most advanced multi-slice CT system. Over the past three decades, CT has made significant improvements in speed, patient comfort, and resolution. Today, CT scans are used to image bone as well as soft tissues. Because the digital image is sharp, focused, and three-dimensional, many structures can be better differentiated than with standard X-rays. CT has also been widely used for non-medical purposes, such as archaeology, soil science, biology, aviation security and non-destructive materials testing. However, other fields, such as chemistry, have not yet taken advantage of tomographic techniques. But, say chemists, the advent of nanotomography is beginning to change that. With recent advances in tomography, it has become possible to achieve experimental resolution at the nanoscale, which has enabled scientists to determine the three- dimensional (3D) distribution of materials. The need for 3D visualization and analysis at high spatial resolution is likely to increase as nanoscience and nanotechnology become increasingly important and nanotomography could play a key role in understanding structure, composition and physico-chemical properties at the nanoscale. In the critical review "Nanotomography in the chemical, biological and materials sciences" (free access article), published in The Royal Society of Chemistry, scientists from the Electron Microscopy Group at the University of Cambridge in the UK report that nanotomography is becoming an important tool in the study of the size, shape, distribution and composition of various materials, including nanomaterials. "The need to develop nanotomographic methods applicable to chemical systems (ranging from the physical to the biological) is therefore pressing, just as it is in the engineering and earth sciences," say the authors. According to the review, it has been long apparent that the spatial resolution attainable by X-rays and electronic beams far exceed what is possible through CT and magnetic resonance (MR) imaging of the human body. According to the authors, 3D spatial resolution of 1 cubic nanometer is now possible, with global efforts underway to reach 3D atomic resolution. In their review of electron tomography applications, the authors discuss current techniques in cryoelectron tomography in the biological sciences; transmission electron microscopy (TEM) and scanning transmission electron microscopy (STEM) tomography in the physical sciences; and energy-filtered transmission electron microscopy (EFTEM). In the biological sciences, cryoelectron tomography may help bridge the gap between the information attainable at an atomic level by X-ray crystallography and the information provided by light microscopy. Perhaps two of the most valuable uses of nanotomography in the physical sciences, say the authors, are high-angle annular dark-field (HAADF) STEM tomography and EFTEM. HAADF STEM imaging is ideal for tomographic reconstruction as it generates strong contrast that has a fully monotonic relationship with atomic number and thickness. EFTEM involves collecting multiple, or sometimes a series, of energy-filtered images. Information from an energy loss image can be isolated by generating either a background-subtracted elemental map or a jump-ratio map. Other nanotomography techniques discussed in the article include atom probe field-ion microscopy (APFIM) and serial-sectioning. The review concludes with an outlook to the near future, where "it should be possible to reconstruct tomograms of 3D physical properties, such as strain, electrostatic potentials and magnetic fields, and indeed the first proof-of-principle examples of this are now published (e.g. "High-Resolution Three-Dimensional Imaging of Dislocations"). "In addition, the coupling of in-situ and environmental microscopy with tomographic reconstructions will certainly prove to be a powerful combination and should allow deeper insights into, for example, the growth of nanotubes and nanorods and enable a better understanding of the chemistry of catalysts at the nanoscale."